Evolution of the technology continues regularly and tech freak is working hard to make it more easier, convenient and faster. As it had became a part of our daily life, technology is getting more essential for ourselves. Here is a another big example of tech evolution, where Sacn Disk, an American multinational corporation that designs, develops and manufactures flash memory storage solutions and software, have achieve another big record. 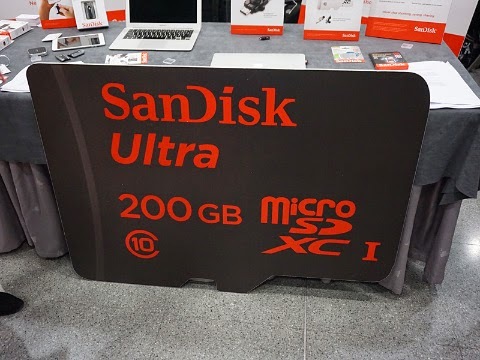 San Disk have managed to cram 200GB of memory into a MicroSD card. This new card have 56 percent more higher capacity than the earlier one (128 GB). San Disk commented that they have managed to achieve this by using a proprietary design and production process that allows for more bits of memory per chip. Memory chips are typically sized in powers of 2, with steps such as 16GB, 32GB, 64GB and 128GB. Keeping that pattern would result in a 256GB chip, but it appears SanDisk wasn’t able to do that. Instead, it settled for 200GB. This higher capacity card will be available in the second quarter and its tagged for $400. The card supports data transfer at upto 90MB per second, or around 1,200 photos per minute. This is really a great achievement for the company as they have managed to fit this much of the memory bits into a chip. San Disk have not provided much details on the process they used on exploring the currents limits of the storage.